I will get phone out and threaten 101. We have had 2 letters from Resolve call to say that they're going to pay a visit (deep joy). Could be any day now. Does anyone have any experience of them calling? Am I likely to get a scary bloke turning up in the evening? Do they come in working hours? Do they come back if we're not in? Or should I start a Resolve Call thread for help? I am pretty scared as I am at home with 2 kids a lot on my own. Well no, not really answered my questions. When/if I speak to them and tell them to leave, will they come back? bar the last one which is no. So an update, and I must admit I am getting a bit worried now. For my 2 DFd Idem/MBNA accounts, I get automated Resolvecall phone calls which I ignore. Someone did call out and they left a card. Nothing else. Automated calls carry on, but not daily. They say we have to do this to avoid court action. Having looked on this forum, I can see that Idem DO take court action so I am pretty worried now. 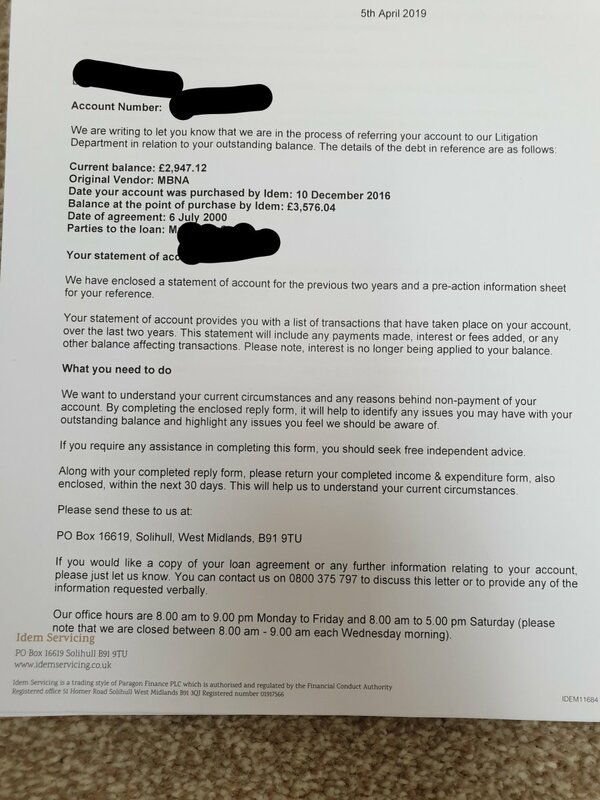 Looking on another site, there's a letter which people have been advised to send back, which demands that they prove that the debt is unenforceable. Why does my husband have this and not me?? Is it titled pre action protocol.. letter of claim..with a response pack inc? It did have a copy of the last 2 years payments, a page to fill out for income and expenditure and some stuff on where to go for help. look like their version of a pre action protocol letter. have you something like the attachment here too? The post from 15th October 2017? So they're taking it further then?? Also, what reasons do I add in? Why am I disputing it? Do you have your husbands CCA ...or not? As for Resolvacall - I had them call the other day - nice chap - told him to send it back to Idem as its 'unenforceable' ! He said "when did you speak to them" - I said "I haven't ...its ALL IN WRITING". He tried frantically to phone Idem but then couldnt get on the internet with his works phone to find the password they required as he was speaking to them. He left rather red faced and sloped a card in my hand. I followed this up with a 'ACCOUNT REMAINS IN DISPUTE UNTIL YOU FIND THE CCA I AM STILL WAITING FOR' letter to Idem, stating their harrassment dates / & harrassing Resolvacall visit/card. you shouldn't speak to powerless DCA's either!! did we ever CCA them? and what did we conclude? It is clearer on the paper copy and can be read. Then copies of the T&Cs which they say would have been sent were also sent. Yes I CCA'd them and pretty sure I uploaded it. pdf it pleaseor find it in the thread here. Both of my CCAs were pretty much illegible. My husband's form is quite clear though, but it was a simple 2 page form, which refers to lots of T&Cs. The actual T&Cs that accompanied the CCA was a photocopy of what would have been their standard T&Cs at the time apparently - not necessarily the exact ones he would have seen. I have now had the same PAP letter for my 2 accounts saying that they're referring my accounts to their litigation department so all 3 accounts now passed to their litigation department. So 3 PAPs to complete. I have the CCAs so there's no point in asking for that again is there? But in box D, what do I write as to why I'm disputing it? I will get these sent back to them over the next few days. Re. post 232, if I had all the time in the World and a scanner I could have uploaded these docs. However, I will have to buy a scanner to scan the hundreds of pages, but I will. I will do this as soon as I possibly can. which doesn't make the text any bigger...……………….